On this page we will provide angular 2 template reference variable example. A template reference variable is a reference to a DOM element or directive within a template. Using template reference variable we access the values of DOM element properties. Template reference variable is declared using # and ref- as prefix, for example #myVar and ref-myVar. We should not duplicate template reference variable name because in this way it may give unpredictable value. Here on this page we will provide example of template reference variable for input text box, select box and NgForm directive step by step using TypeScript. Find the software used in our demo. We can use template reference variable by two ways. Here myVar will be a template reference variable. Here we will discuss template reference variable using input text box. Template reference variable is a variable using which we can access DOM properties. In our example we are using following DOM properties of input box. 3. value Now find the code snippet. In the above input text box #mobile is a template reference variable. To fetch DOM properties, we do as follows. mobile.placeholder : It will give placeholder of our text box if we have specified. mobile.value : It will give value of our text box. 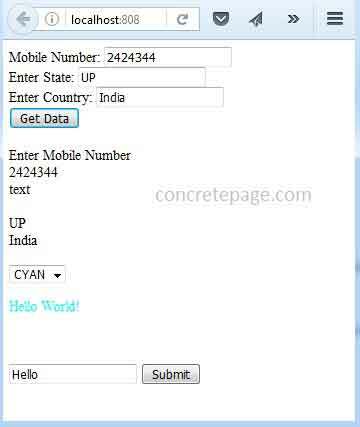 mobile.type : It will give type of input element. In our example type is text. Here we will discuss template reference variable with select box. Look at the code snippet, #myColor is a template reference variable. The selected value of select box can be accessed by myColor.value . Now we will discuss how to access NgForm directive using template reference variable. We are creating a sample form here. ngSubmit : It enables binding angular expressions to onsubmit event of the form. Here on form submit onSubmitPersonForm component method will be called. Here we are using template reference variable for ngForm as #myForm="ngForm" . Now we can use myForm in place of ngForm such as to check form validity and we can also use it in our angular expressions. Find the steps to run the example. 1. Install Node.js and NPM in the system if not already installed. Make sure that Node.js version must be 4.x.x or higher and NPM version must be 3.x.x or higher. 2. Download the source code using download link given below in the example. 3. Go to the root folder of the project using command prompt and run npm install command. 4. Now run npm start command. 5. Now run index.html file. Find the print screen of the output. The output in browser console is as follows.